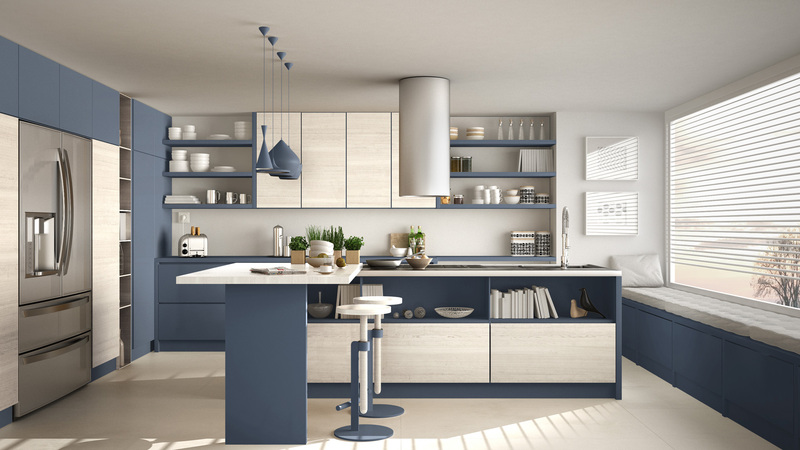 This year, the new colors on the block in the kitchen cabinet scene are navy blue and purple. You might find this surprising – but if we scratch the surface a little we can quickly understand why. Perhaps, in school, you learned about color theory and if you need a little reminder, colors can reflect and influence our mood. All the colors in the spectrum are organized on a color wheel. The wheel considers some colors “warm” and some “cool”. The colors yellow, red and orange are warm. When you sit in a cozy yellow kitchen you feel just that, cozy and warm. All because your mind sees yellow and reads warm, comforting, and sunny. The colors green, blue and purple are cool colors. This means when you are sitting in a kitchen with a blue color scheme you are likely to feel chilled out and cooled down. Now, is it making more sense why navy blue and purple are the two new hot trends as summer approaches? Of course, there isn’t one particular reason why a color begins trending at a given moment. 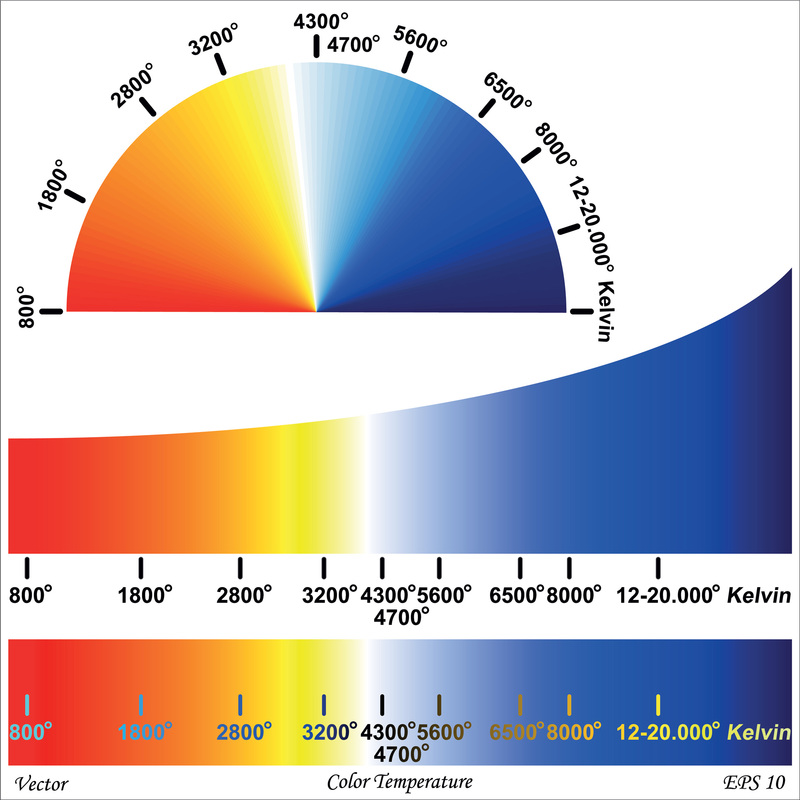 However, the fact that people are anticipating the approaching heat of summer seems a simple driving force towards choosing cooler color schemes. Navy blue is a delicious color which often goes unsung and unappreciated. However, at the moment, navy blue is trending and finally it’s moment of glory has come. At the moment, we can see kitchens using navy blue cabinets splashed over every magazine and blog. The color is very versatile and works well on cabinets in a kitchen with contrasting lighter colors. For example, in a two-tone color kitchen with white and blue, the navy blue cabinets act as a strong contrast with white walls and wood highlights. In a one-toned blue color kitchen, the navy blue cabinets can contrast with other blue elements used in lighter tones. Navy blue comes in a wide range of different tones. You can find rich shades of the color, to more muted shades which lend well to matt textures. 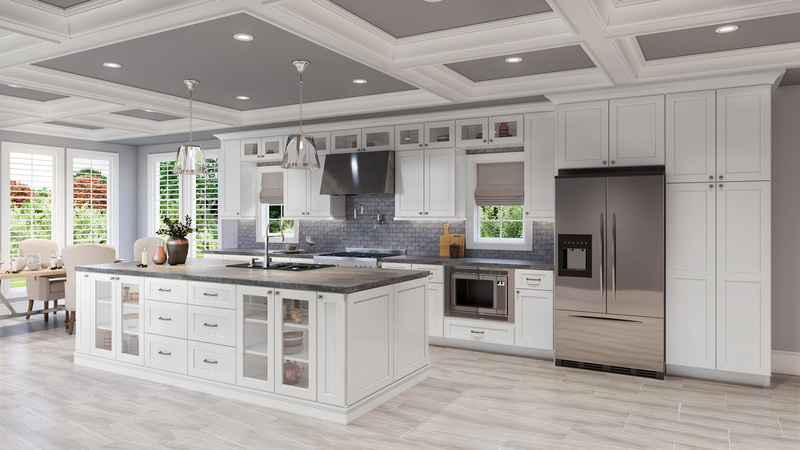 Once you know you want to use navy blue in your kitchen, you can choose the shade you would like based on the other colors you plan to use in your kitchen makeover. Navy blue gives weight to the room, and the lighter elements act as a contrast. The result? A modern space, a new take on classic forms, and a refreshing space for you to entertain in. Purple is a strong color reflecting creativity and innovation. This year, the color is trending in the design world. Perhaps, it is no coincidence Pantone chose UltraViolet as their color of the year for 2018. Even so, as a powerful color, you need to use purple with care. Purple is not a color to create a one-tone kitchen with purple everywhere. Of course, there is nothing to stop you but you might raise a few eyebrows! Rather, you can use purple as an accent tool, and in this way introduce sparks of creativity into your kitchen space. You can use bright or pastel purple kitchen cabinets to add a dash of spirit to your kitchen. The cabinets then act as a focal point. 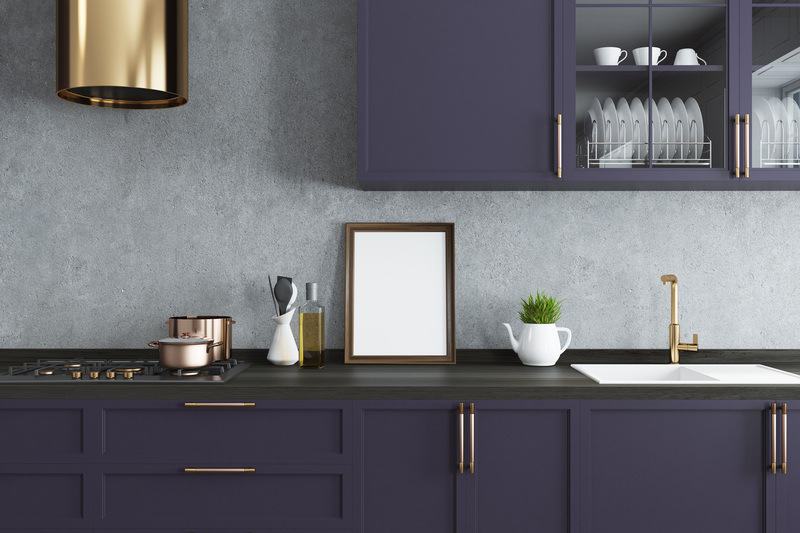 You can combine purple kitchen cabinets with a lot of white or grey elsewhere in the kitchen which balances the power of the color very well. Purple also comes in darker and more muted tones, so you don’t have to think purple necessarily has to mean big, bright, and dramatic. Not necessarily. 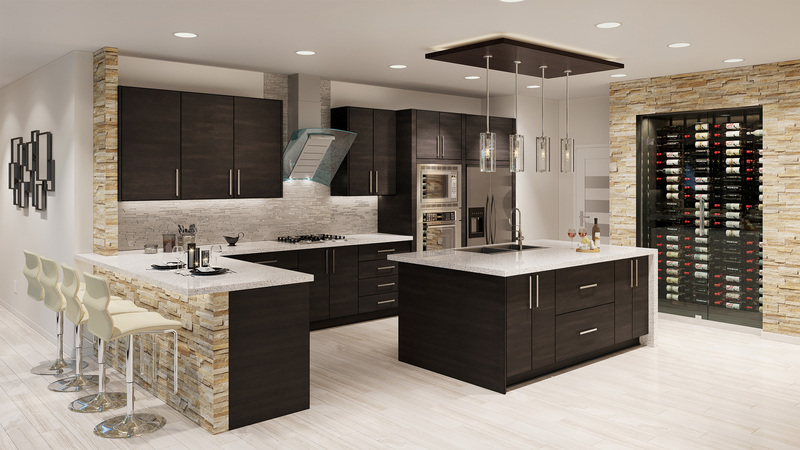 By using darker eggplant tones on your kitchen cabinets, you can create a beautiful smoldering room. Darker shades of purple work very well with metals, and grey colors elsewhere in the room. A less surprising trend in the kitchen design world is the ongoing use of neo colors. This means the three colors, black, white and grey. It’s a well-established fact that white is a popular choice for kitchens, and continues to be an essential color tool. White is a great choice for a one tone kitchen but works well with any other color in a two-tone kitchen as well. Using white is a good way to make space in your kitchen for bright colors. This is because white doesn’t compete and allows the brighter color to do it’s thing while tempering down the color’s boldness so it doesn’t overwhelm. Grey has been steadily rising in popularity in kitchen color themes over the last number of years. While grey sometimes gets a bad rap, the color is actually very versatile and useful. With some care, you can use grey in the kitchen and achieve some truly beautiful results. When using grey, think about the colors you can partner with it. Gray works well with carefully placed bright accent colors and the result can give a very modern feel to the room. 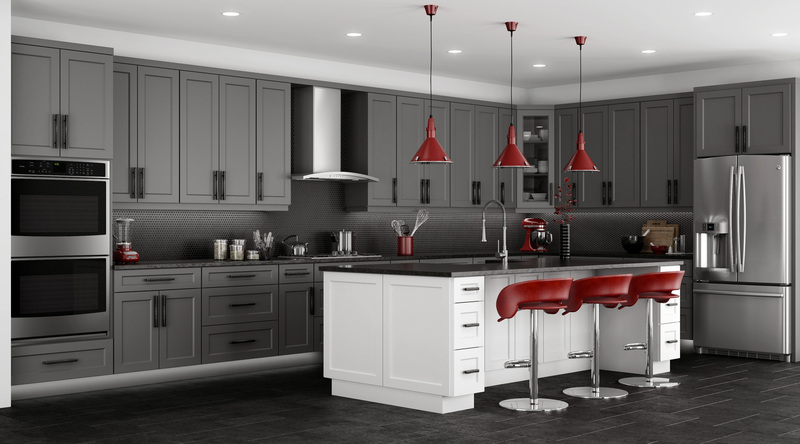 You can also use grey as a stepping stone between white and black in the kitchen. In general, too much dramatic contrast in the form of white and black in the kitchen doesn’t work. However, you can use well-placed grey features to temper the contrast between them. Dark goes with everything and works great in the kitchen. Especially, if you are itching to do something bright and bold. Some carefully placed black elements with bright highlights or accent walls can create a kitchen with a big wow effect. But, take care not to go overboard with dark. The color needs other colors to contrast with or to temper it down.